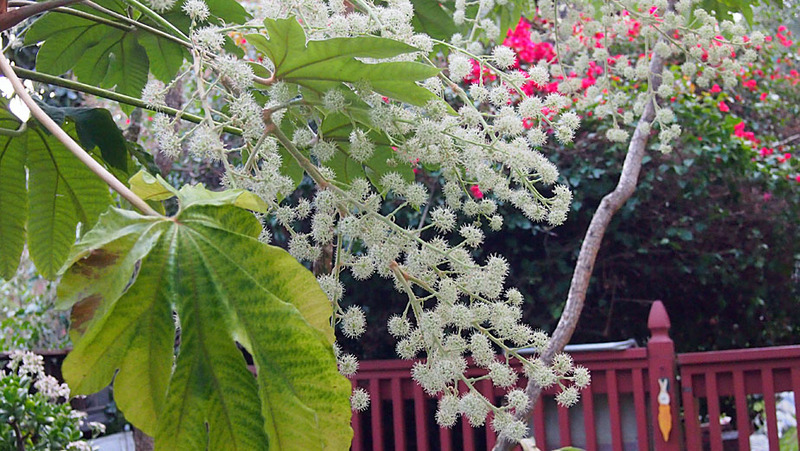 Our rice paper trees (Tetrapanax papyriferum) along the north side of the house are getting into their version of the holiday spirit with explosions of snowball-like blooms. In short order the bees will find them and after that the birds will devour the subsequent berries. Then in the spring and summer if I’m not careful when removing the dead and dying leaves and flower stalks I will inevitably ingest/inhale the copious amounts of pollen shaken free and endure some pretty dramatic allergic reactions. We’re talking airway constriction, burning eyes and sneezing fits that would place in the top three of any national competition taking place. Seriously: Waaaaaaaaaa–CHOOOOOOO!!! The inflorescence is a large panicle of hemispherical to globular umbels near the end of the stem. “Globular Umbels” is the name of a band waiting to happen. Someone make it so. This entry was posted on Saturday, December 17th, 2011 at 8:13 am and is filed under nature, seasonal. You can follow any responses to this entry through the RSS 2.0 feed. Both comments and pings are currently closed.